When you are planning on purchasing a diamond, it’s important that you know as much as possible about how diamonds are classified. In the same way that you check the Blue Book value of a car before you buy it or the Zagat rating of a high-end restaurant before you book a reservation, you can compare the quality and value of diamonds based on the 4Cs of Diamonds. Once you fully understand the 4Cs of Diamonds, you can use them to your advantage, learning how to prioritize one over the other to find a beautiful diamond within your budget. 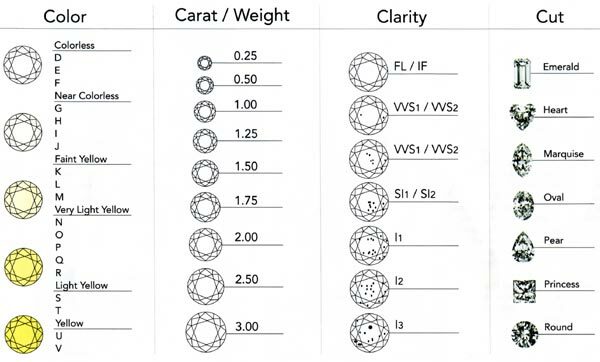 There are four topics you need to become familiar with: Cut, Color, Clarity, and Carat Weight. The carat weight of a diamond is determined by weighing the diamonds on an electronic scale free of the rest of the ring. Carat is the standard unit of weight of a diamond and most other gems, it is a metric unit equal to 0.20 grams. The heavier the diamonds are the more valuable it will be. The price per carat of diamonds increase as weight of the diamonds increase. An example could be a 2 carat diamond could be double the price of a 1 carat diamond, or can be as much as a .99 carat diamond will cost less than a 1 carat diamond. The clarity of a diamond describes the presence of internal and external flaws through using magnification. A perfect stone without any flaws is rare, however most flaws can only be seen through magnification. The clarity is described using a grade system. The higher the clarity grade the more expensive the diamond will be, it is also rarer. These diamond have no flaws internal or external. These diamonds have no internal flaws, only minor external blemishes. These diamonds have very, very small blemishes, that are impossible to see with the naked eye and are slightly difficult to see under magnification. These diamonds have very small blemishes, that are impossible to see with the naked eye and are slightly difficult to see under magnification. These diamonds have small blemishes that can be seen with the naked eye and are slightly easy to identify under magnification. These diamond have flaws that are moderately visible to very easily seen to the naked eye. The color of diamonds have a large impact on the price of diamonds, after the carat weight. Though diamonds appear colorless, many have a small trace of yellow or brown color. The absence of any color allows the diamonds to act as prisms, separating white light into a rainbow of colors. The more transparent the diamond is the higher the value. This colorless diamond would be considered a “D” on the grading scale. Colorless to light yellow are graded on a scale “D” through “Z”. Diamonds of color such as blue, pink, purple ro red are considered “fancy” diamonds. The cut of a diamond is not to be confused with the shape of the diamond (princess, oval, etc) rather it is the measure of symmetry, proportion and polish. A proportional diamond that was properly cut will allow light to enter and reflect back to the viewer’s eye. Sometime’s diamond cutters will sacrifice the perfect cut to create a larder diamond, this will diminish the brilliant appearance of the diamond making it look dull or dark. The polish grade of the diamond describes the smoothness of the diamond. The cut of the diamond are determined on a symmetry grade scale of excellence (EX), very good (VG), or good (G). Avoid diamonds with symmetry grades of fair (F) or poor (P).